Eleven-year-old Jordan Huling gave up sleeping in on Presidents Day to play basketball. 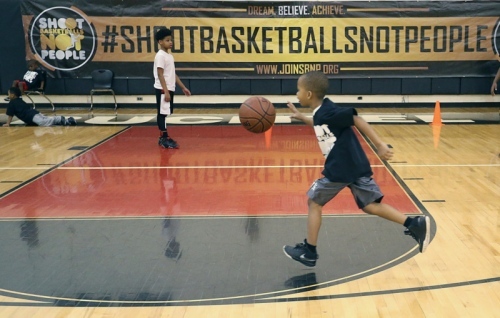 Shoot Basketballs Not People is a Philadelphia-based nonprofit organization that aims to do exactly what Jordan discerned — teach fundamental basketball skills while promoting healthy lifestyle choices. It also works to increase participation in sports and to help parents support children in sports and in the classroom. Alex Abreu wants to play college basketball again. And he wants to play at the University of Akron. He’s just not sure if that plan will work out. If not at Akron, then maybe at another Division I school, he said, or he could turn pro. ​He made the comments before speaking in front of more than 80 elementary school kids, parents and volunteers gathered at the John R. Buchtel Community Learning Center as part of the second annual Shoot Basketballs Not People clinic. They are not royalty on the basketball court or stars of the big screen. It’s possible you’ve never even heard their names. Raised in Akron, they’ve left to pursue careers elsewhere. But that doesn’t mean they’ve forgotten the people in this city who once kissed their skinned knees, guided them as teenagers and instilled the importance of a good education. They’re so appreciative that they return often to give back to the city they love and the townspeople who shaped their lives. Eric R. Jones Fletcher II and Steve King graduated 10 years ago from Akron’s Buchtel and Garfield high schools, respectively. Both were academically gifted and received college scholarships. 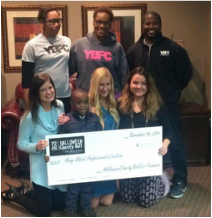 Two years ago, as successful scholars and businessmen, they founded the Young Black Professionals Coalition (YBPC), a nonprofit organization that focuses on the development of future leaders. "I Know I Can" Back To School Drive provides school supplies, haircuts and more. I Know I Can Back-To-School Drive from New Realm Media on Vimeo. Every day, Gail Rebovich calls a different place home. “We’re pretty much going from place to place — a tent, abandoned houses, any place we can go,” she said. Rebovich, 31, was gathered with a dozen or so fellow homeless under Akron’s Y-bridge at noon Sunday when volunteers arrived to pass out free bagged lunches and words of encouragement. The outreach was part of the region’s first #HashtagLunchbag, a nationwide effort to feed and inspire the homeless population. Akron’s Young Black Professionals Coalition helped organize the local event, which kicked off Sunday morning with about 50 volunteers packing more than 200 lunches at the Akron Urban League. So did his boyhood friend, Eric Fletcher. Their return to Akron didn’t bring ESPN cameras or gushing broadcasters. There was no Twitter frenzy or billboards. There were, however, tons of hugs for the two former Akron men, who returned to their roots Sunday with their small army of volunteers for a seventh year. Their mission: Get as many kids ready for school as possible. And during the seventh annual “I Know I Can” back-to-school drive and fair on East Tallmadge Avenue, as many as 500 schoolkids were getting backpacks loaded with supplies. Steve King isn’t happy with the violence in his hometown. Shootings and murders are getting more frequent in Akron, he said, and the thugs and their victims are getting younger. So the 28-year-old King, who now lives in Columbus, helped organize Shoot Basketballs Not People, a free basketball clinic for kids Monday. 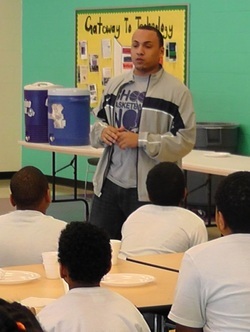 The event, held at Innes Community Learning Center in the city’s Kenmore neighborhood, was designed to teach participants as much about getting along with each other as it was to hone their basketball skills. It attracted about 200 kids ranging in age from elementary school to high school.